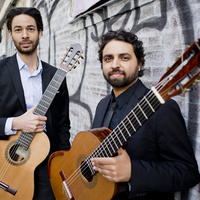 Duo Noire, featuring innovative classical guitarists Thomas Flippin and Christopher Mallett, will perform audience friendly works that they've commissioned by highly accomplished contemporary female composers, including new pieces by Clarice Assad, Courtney Bryan, Gabrielle Herbst, Golfam Khayam, Mary Kouyoumdjian, Gity Razaz, and Feripsichorée Gabriella Piesmith. Panel discussion immediately afterwards, moderated by GU Prof. Anna Celenza, on "Women in Music: Current Disparities and Ways to Address Them." Panelists include Alexandra Gardner, Shannon Gunn, Anna Pidgorna, Ariel Elizabeth Shelton, and Annika Socolofsky.